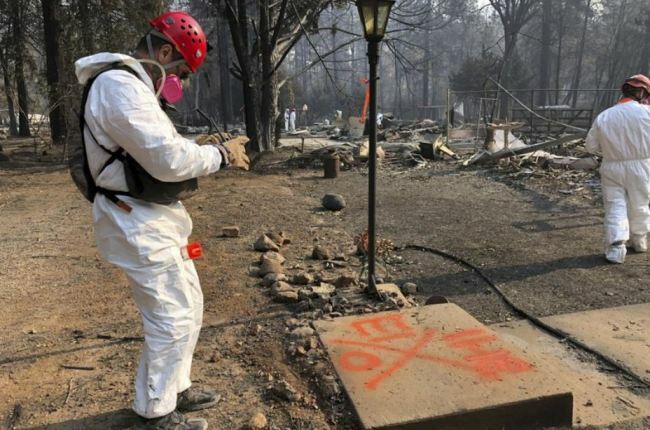 CHICO, Calif. (AP) — Volunteers in white coveralls, hard hats and masks poked through ash and debris Sunday, searching for the remains of victims of the devastating Northern California wildfire before rains that are forecast for this week complicate their efforts. While the predicted downpours could help tamp down the blazes that have killed 76 people so far, they also could wash away telltale fragments of bone, or turn loose, dry ash into a thick paste that would frustrate the search. The members of the team scrutinized the rubble in five-minute sweeps, using sticks to move aside debris and focused on vehicles, bathtubs and what was left of mattresses. When no remains were found, they spray-painted a large, orange “0″ near the house. He said his approach was to try to picture the house before it burned and think about where people might have hidden. Nearly 1,300 names are on a list of people who are unaccounted for more than a week after the fire began in Butte County, authorities said late Saturday. They stressed that the long roster does not mean they believe all those on the list are missing. The remains of five more people were found Saturday, including four in Paradise and one in nearby Concow, bringing the number of dead to 76. Northern California’s Camp Fire has destroyed nearly 10,000 homes and torched 233 square miles (603 square kilometers). It was 55 percent contained.